I should just point out that I will not have time (or the will power) to go through all the generic constraints that F# supports, but I will try my best to show the basics. It can be seen that although I did not actually ask for he arguments to be generic they were inferred to be generic ones. You can of course implicitly say that you wish a certain parameter to be generic, which is done using the single quotation syntax which is typically “’a” to show that a type is expected to be a generic one. 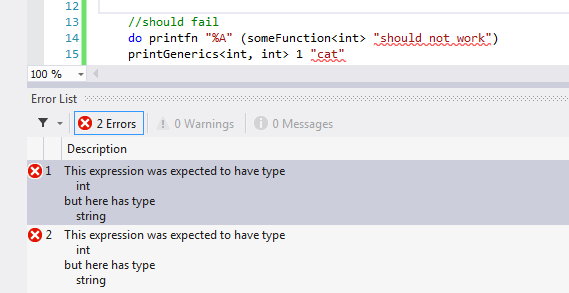 It is also possible to create explicit generic functions/types. This is done using the angle bracket syntax “<T>”, which would undoubtedly be familiar to any C# developers reading this. 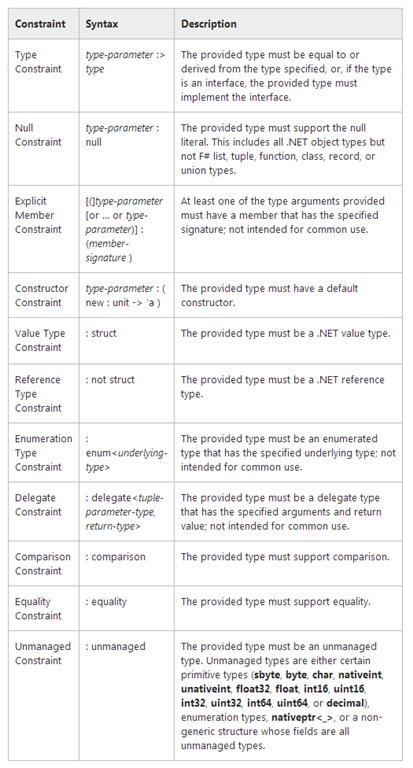 Here is are the 2 previous examples rewritten to use explicit generics. I have also included a 3rd function which expects 2 generic parameters which are simply printed to the console. // A generic record, with the type parameter in angle brackets. // A generic discriminated union. We now move on to look at generic constraints in F#. Generic constraints are used when you work with generic types to limit what may be allowed as generic type. Constraints may sometimes be required, as without them the compiler would have no way of verifying the features that are available on the generic type until runtime. Most commonly this would be to say that the generic type inherits from a certain base class or implements a certain interface, but in F# there is a very good generic constraint system that allows us to constraint quite a few things. Lets have a look at one or 2 of them.